SAN JUAN — Sept. 20 marked a year since Hurricane Maria devastated Puerto Rico. Many of the U.S. commonwealth’s more than 3 million residents are trying to return to some sense of normalcy, but signs of Maria’s destruction remain visible throughout Puerto Rico. Anger over the pace of recovery and President Trump’s response to Maria remain widespread across the island. A traffic light in San Juan’s Ocean Park neighborhood on Sept. 18, 2018. 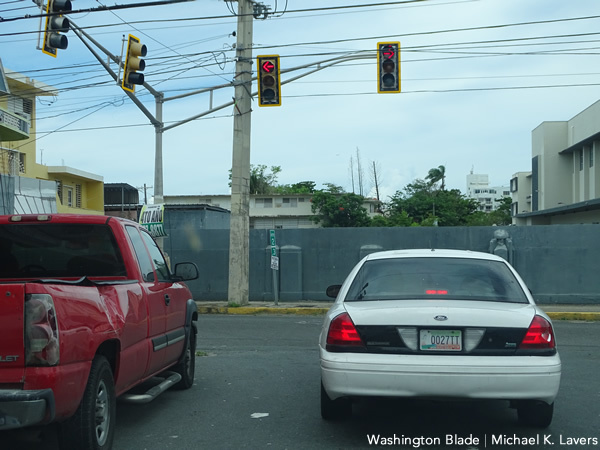 One of the lingering impacts of Hurricane Maria in Puerto Rico is the lack of working traffic lights. 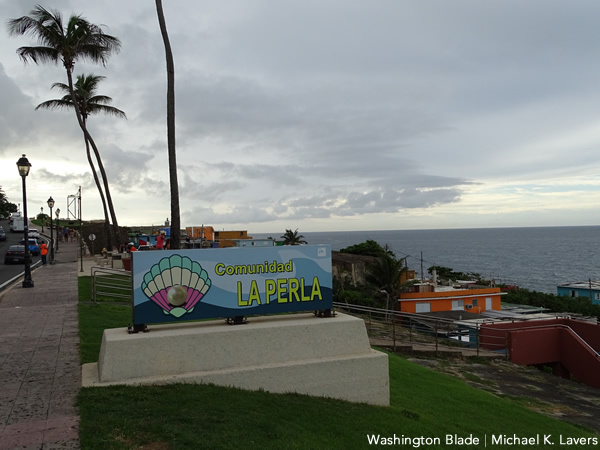 A sign welcomes visitors to San Juan’s La Perla neighborhood. 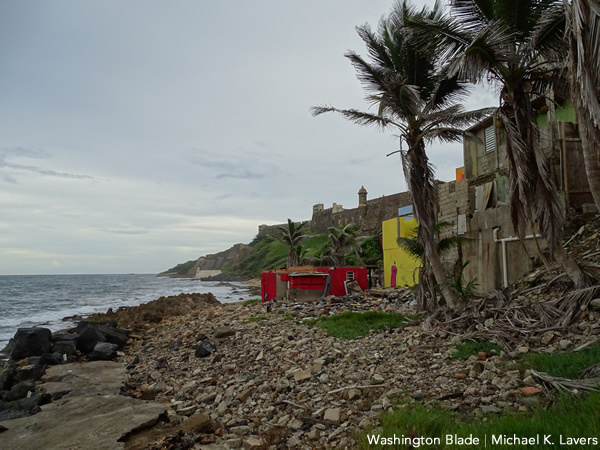 Hurricane Maria destroyed many homes in the working class neighborhood that is adjacent to Old San Juan. Bathroom walls are all that remains of the second floor of this house in San Juan’s La Perla neighborhood. A bathtub was visible on Sept. 18, 2018. A damaged house in San Juan’s La Perla neighborhood on Sept. 18, 2018. 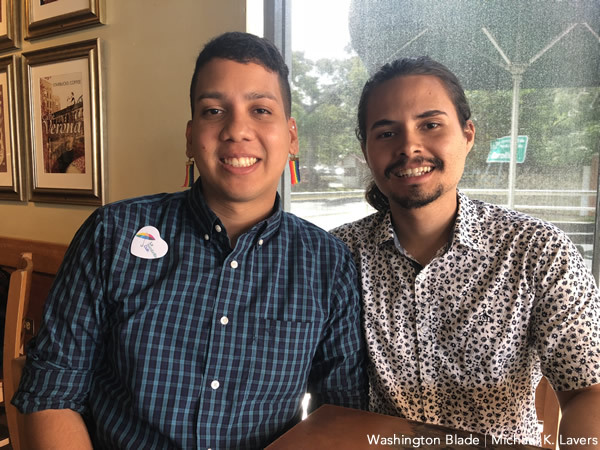 From left: Brian Ínaru de la Fuente of La Sombrilla Cuir, a Puerto Rican LGBTI advocacy group, and Raymond Luis Rohena of the Puerto Rico Trans Youth Coalition spoke with the Washington Blade at a Starbucks in the San Juan suburb of Carolina on Sept. 19, 2018. 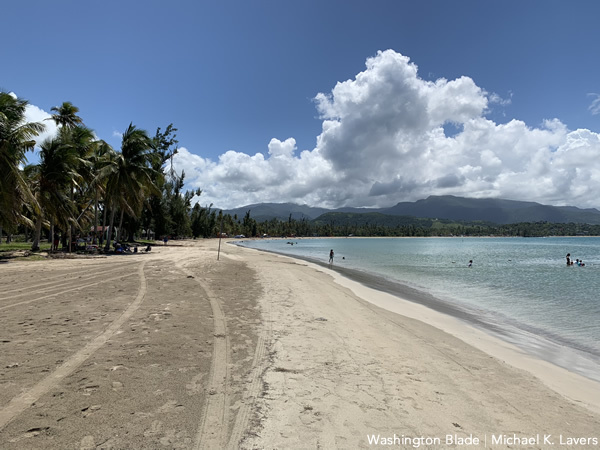 Ínaru and Rohena said discrimination and a lack of employment and housing have made LGBTI Puerto Ricans even more vulnerable after Hurricane Maria. 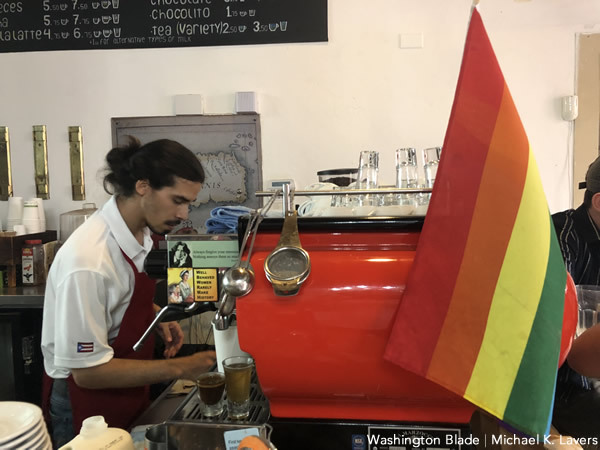 A Pride flag hangs from an espresso machine at a coffee shop in Old San Juan on Sept. 19, 2018. 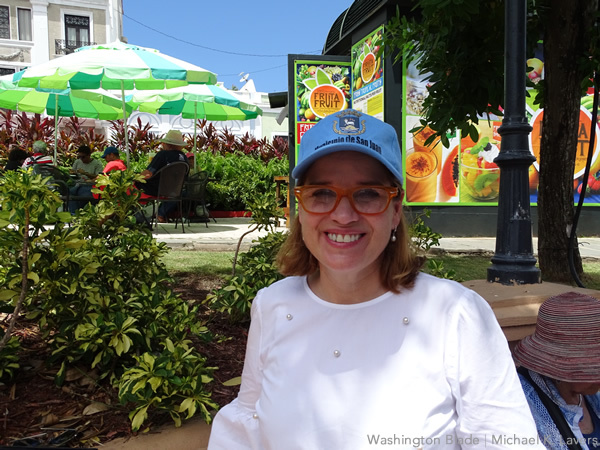 San Juan Mayor Carmen Yulín Cruz spoke with the Washington Blade in Old San Juan on Sept. 19, 2018. She remains among the most vocal critics of President Trump’s response to Hurricane Maria that has sparked outrage in the U.S. and around the world. 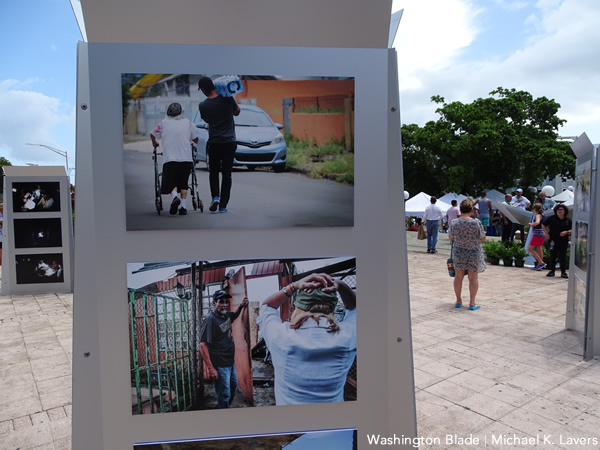 A photo exhibit that marks Hurricane Maria’s anniversary in Old San Juan’s Columbus Square on Sept. 19, 2018. 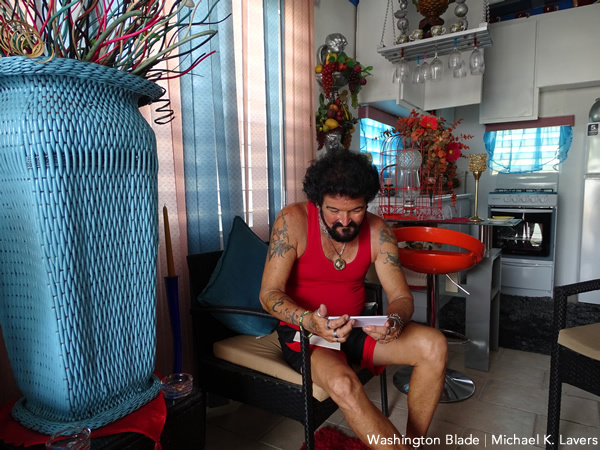 Ricky Santiago looks at pictures in his home in Humacao on Sept. 19, 2018. Hurricane Maria destroyed his hair salon and the second floor of his family’s house in which he was living. 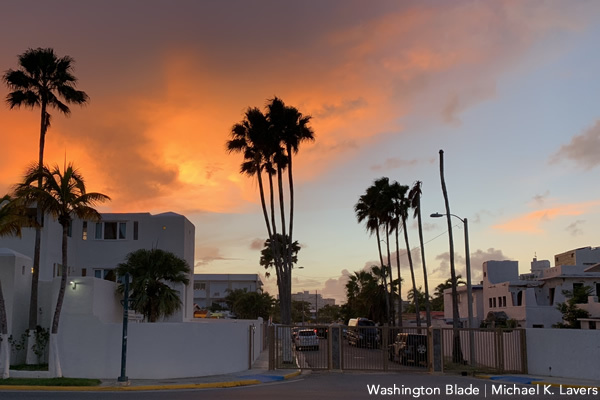 Waves Ahead, a group that is helping LGBTI Puerto Ricans and other vulnerable groups recover from Maria, helped Santiago convert his damaged salon into his new home. 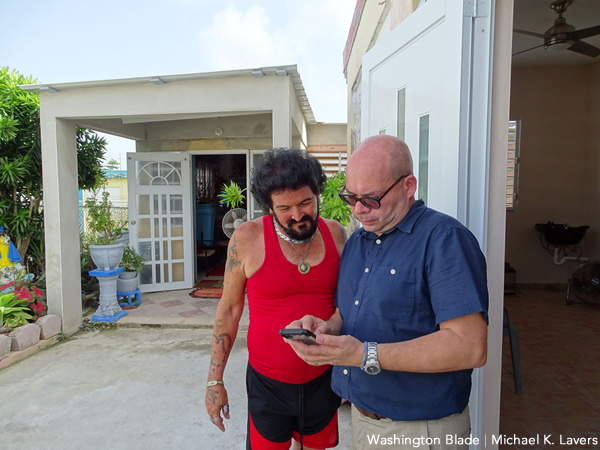 From left: Ricky Santiago speaks with Wilfred Labiosa, co-founder of Waves Ahead, at his family’s home in Humacao on Sept. 19, 2018. Waves Ahead helped Santiago convert his hair salon that Hurricane Maria destroyed into his new home. 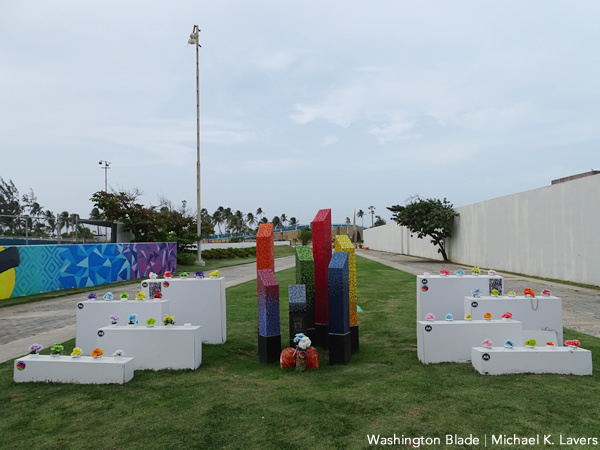 Puerto Rico’s first LGBTI-specific monument in San Juan’s Third Millennium Park on Sept. 19, 2018. San Juan Mayor Carmen Yulín Cruz unveiled the monument less than a month after the Pulse nightclub massacre in Orlando, Fla. Nearly half of the victims were LGBTI Puerto Ricans. 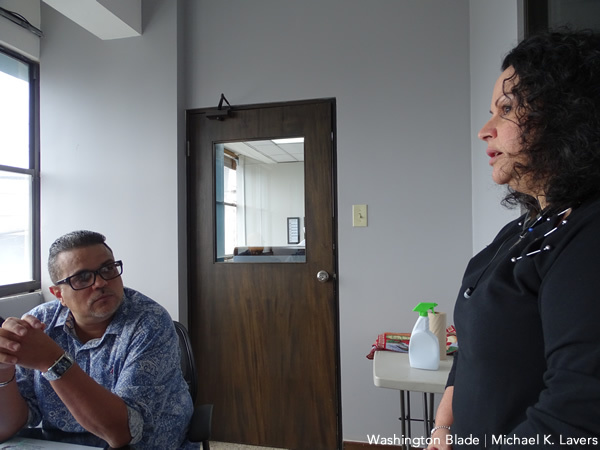 From left: Bill’s Kitchen Executive Director Sandy Torres speaks with Angel Rodríguez, one of her organization’s volunteers, at her organization’s headquarters in San Juan’s Hato Rey neighborhood on Sept. 20, 2018. Bill’s Kitchen prepares meals for people with HIV/AIDS and other diseases. 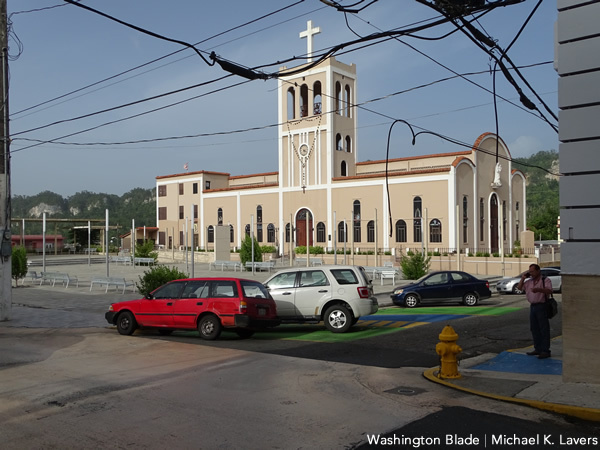 The organization was without power for more than four months after Hurricane Maria made landfall. Food and Friends, a D.C.-based organization that prepares meals for people with HIV/AIDS and other diseases, helped Bill’s Kitchen replace its generator that Maria damaged. 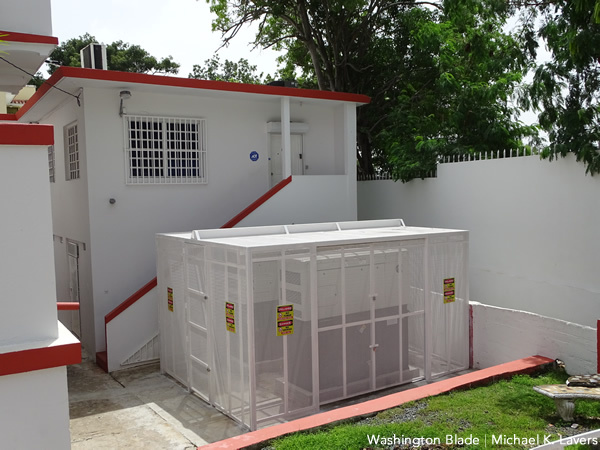 Puerto Rico Community Network for Clinical Research on AIDS, a San Juan-based HIV/AIDS service organization, installed two large generators outside of their offices after Hurricane Maria. The generators began to operate less than a month ago. 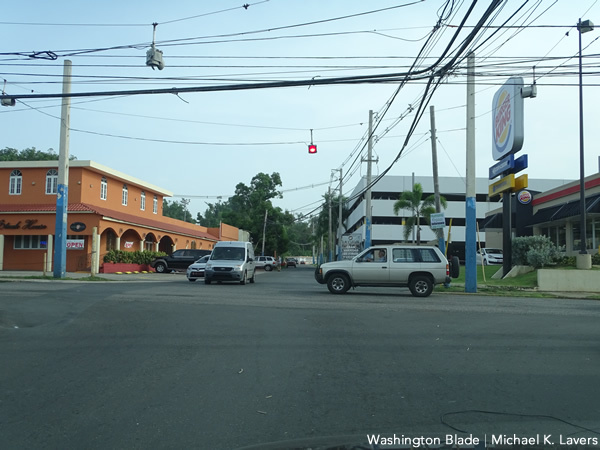 An intersection in Manatí on Sept. 20, 2018. Manatí is among the municipalities through which Hurricane Maria’s eye passed. Power lines on Sept. 20, 2018, were hanging precariously over a street that runs along Ciales’ main square. The entire island of Puerto Rico lost power after Maria, and hundreds of thousands of people in the U.S. commonwealth had no electricity and/or running water for months after the hurricane. Puerto Rico’s electrical grid remains extremely fragile a year after Maria. Hurricane Maria destroyed this bridge over the Río Grande de Manatí that connected Ciales and Morovis. 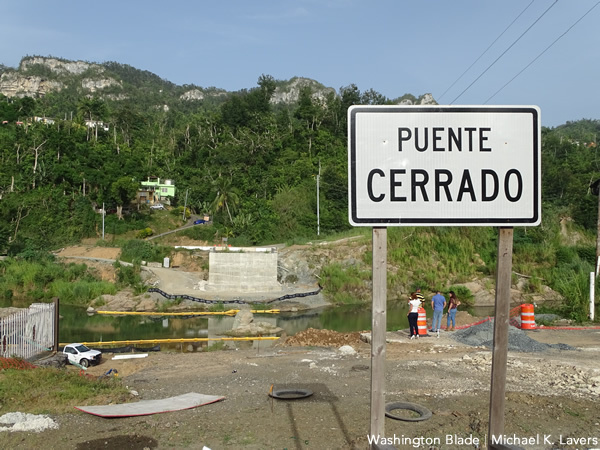 Sept. 20, 2018, marked a year since Maria devastated Puerto Rico, and the bridge has yet to be repaired. 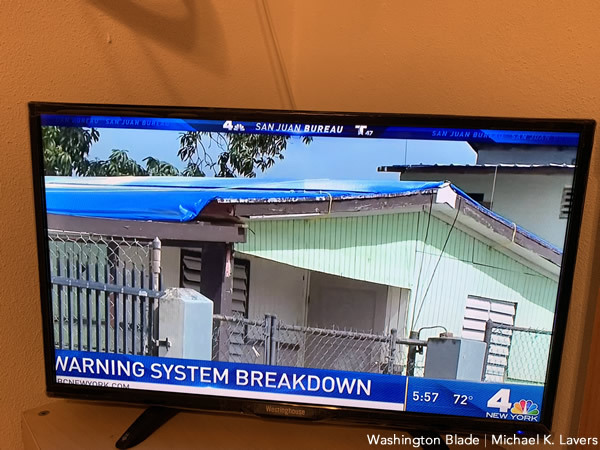 A New York television station’s Puerto Rico bureau on Sept. 21, 2018, aired a report about the continued impact of flooding that devastated Toa Baja during Hurricane Maria. 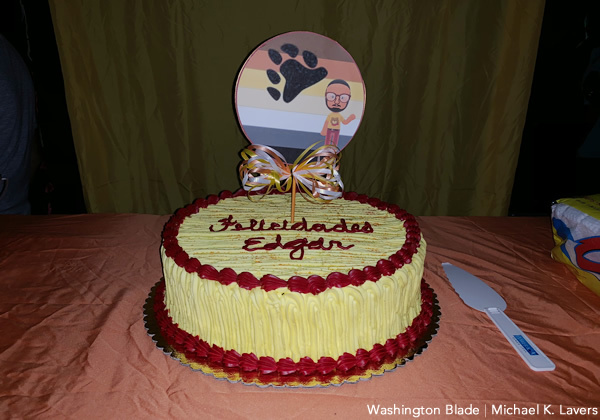 Edgar Santos García celebrated his Birthday at Bear Tavern PR in San Juan’s Ocean Park neighborhood on Sept. 21, 2018. The gay bar reopened eight days after Hurricane Maria devastated Puerto Rico. 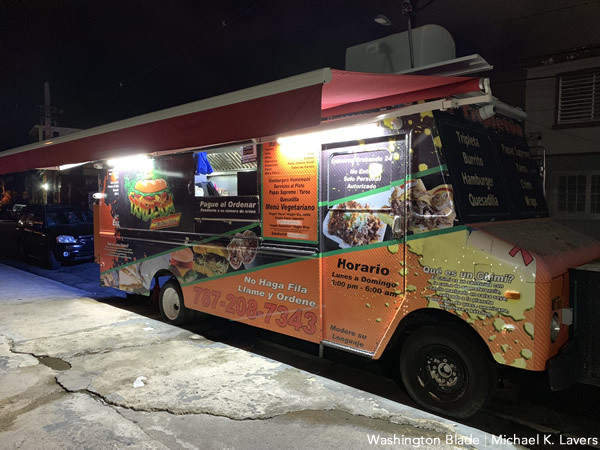 A food truck on a street in San Juan’s Ocean Park neighborhood on Sept. 22, 2018. 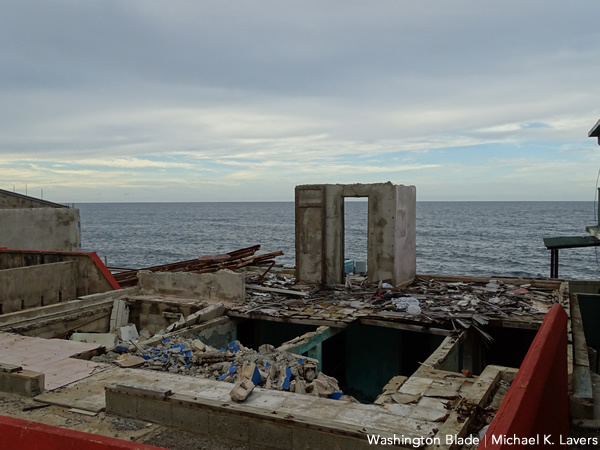 The area was under several feet of water in the days after Hurricane Maria. 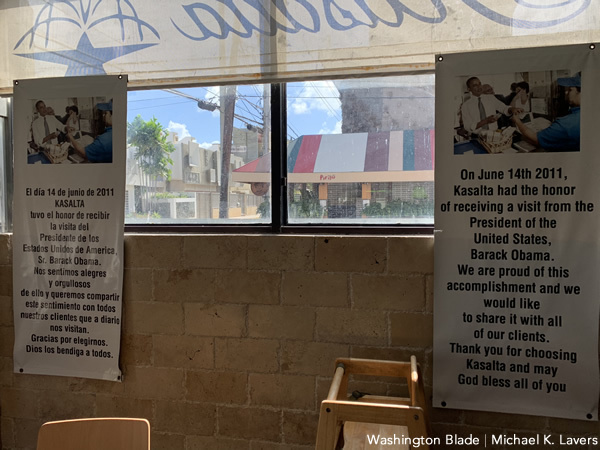 Kasalta, a restaurant in San Juan’s Ocean Park neighborhood, on Sept. 22, 2018, had banners on the wall that note former President Obama visited it in 2011. 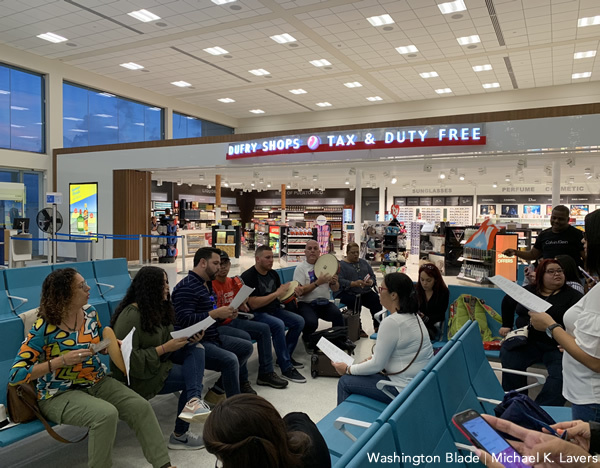 A group of musicians perform at Luis Muñoz Marín International Airport in San Juan on Sept. 22, 2018, before they boarded their flight to Bogotá. One of the musicians was waving a Puerto Rican flag that had “Puerto Rico se levanta” or “Puerto Rico will rise again” written onto it.